Known today as "Kyler Seafood," this outstanding company was originally started in Newark, New Jersey, under the name of Coastal Fisheries. It was founded by Alfred Nanfelt who worked out of his garage and purchased seafood products from the New York Fulton Fish Market. Al made his distributions from a small van, from house to house in the Northern New Jersey area. Before long, by the late 1930's, the company moved to Philadelphia, and by the early 1940's it became the leading supplier of seafood to most supermarkets in the Philadelphia area. Soon they supplied supermarkets from New York to Baltimore and found they were ever expanding. In 1946, the business then settled in New Bedford, Massachusetts, after having moved to Newport, Rhode Island, for a year. Throughout the 50's, 60's, 70's and 80's, New Bedford was the nation's largest fishing industry port. Likewise, Coastal Fisheries, under the direction of Ron Nanfelt, had become the city's largest seafood processor. During the 1960’s, Capeway Seafoods was started in order to fulfill a need for a supplier of "value-added" seafood products for the food service industry. The Howard Johnson chain jumped on the bandwagon and started their campaign of "All the fish you can eat for 99¢." The program became so successful that it went nationwide. Eventually Howard Johnson used so much product that it had to additionally turn to world markets to take care of their needs. Other items produced by Capeway Seafoods were breaded products, pre-cooked products, and frozen IQF (Individually Quick Frozen) products. Coastal Fisheries, along with their subsidiary of Capeway Seafoods, became the largest producer of fresh and frozen seafood fillets in the United States. The third generation of the Nanfelts joined the team in the 1980’s and a seafood company that started from modest means over a half century before emerged as Kyler Seafoods in 1985. Jeff Nanfelt, president and owner, now oversees the production of Kyler’s USDC-inspected Grade A and HACCP-Certified processing plant. Kyler processing includes a wide variety of products - Cod, Haddock, Flounder, Sole, Bay and Sea Scallops, Salmon, Tilapia, Tuna, Lobsters, and numerous other seafood items from all over the globe. Kyler is the pioneer of the nation's largest re-freshed program – a product of longline boats: flash freezing fish, semi-processed-at-sea, and then brought to their New Bedford plant for the final process – creating the highest quality bottom fish products in the country. In 1996, "Kyler’s Catch Seafood Market" was opened. In this gourmet retail market one will find a wide array of seafood products. The market carries an extensive line of seafood and shellfish, in addition to their award winning finishing sauces and a full variety of spices, condiments, oil, marinades and flavored vinegars. The market carries everything from Cod caught on the Georges Banks to Norwegian Salmon flown in fresh from Norway. Kyler’s overwhelming requests for high quality retail seafood has led to an extensive program of shipping fresh products daily across the entire country via Federal Express. 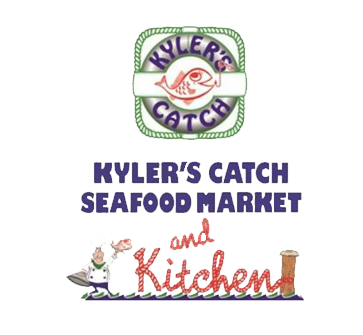 In 1997, Kyler Seafood recognized the need for prepackaged seafood and proceeded to develop a new line marketed under the name of "Kyler's Catch" brand. This unique packaging provides extended shelf-life, as well as consumer-friendly cooking instructions and recipes. With these recent additions, Kyler Seafood is a vibrant and expanding seafood processor that is well aligned to service distributors, supermarkets and, most importantly, the consumer, into the twenty-first century. In 2007, due to the success of the retail market, expansion was necessary and in 2007 Kyler’s Catch Seafood Market doubled the size of its retail space. Realizing the importance that seafood plays in a healthy diet, consumers have come to discover Kyler’s Catch Seafood Market offers them the selection they demand and the quality they deserve.